Carpal tunnel syndrome is a nerve disorder of the hand. It is caused by compression of the median nerve. 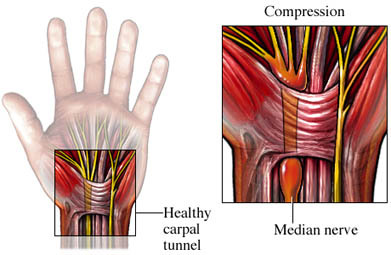 The median nerve gets squeezed inside a narrow passage in the wrist called the carpal tunnel. This nerve provides feeling to the thumb, index and middle fingers, and half the ring finger. Women and older adults are at greater risk for carpal tunnel syndrome. You will be asked about your symptoms and medical history. A physical exam of your arms, wrists, and hands will be done. The exam will include tests of strength, sensation, and signs of nerve irritation or damage. It is important to correct whatever is causing the carpal tunnel syndrome. Sometimes making simple changes in the workplace or home may help relieve symptoms. Rest your wrist by keeping it straight and decreasing activities that worsen pain. Gently apply ice packs to the area. Elevate the hand above your heart to reduce swelling. Do exercises as directed by a healthcare provider. A splint will prevent extreme movements of the wrist. It is most effective when worn at night. It can help avoid waking up at night with symptoms. Surgery may be needed if symptoms are severe, or continue after trying other treatments. The most common procedure is the carpal tunnel release . Minimizing repetitive hand movements when possible. Alternating between activities or tasks to reduce the strain on your body. Keeping your wrists straight when you are using them. Let your arms and shoulders share the stress. Using your whole hand or both hands to pick up an item. Avoiding holding an object the same way for a long time. Get regular aerobic exercise such as walking or swimming. Cut down on caffeine and smoking . These activities may reduce blood flow to your hands. Carpal tunnel syndrome. EBSCO DynaMed Plus website. Available at: http://www.dynamed.com/topics/dmp~AN~T113671/Carpal-tunnel-syndrome . Updated September 1, 2017. Accessed September 7, 2017. Carpal tunnel syndrome. The Female Patient. 1997;21-30. Carpal tunnel syndrome: how you can help your patient overcome the symptoms. Consultant. 1994. Cartwright MS, Hobson-Webb L, et al. Evidence-based guideline: neuromuscular ultrasound for the diagnosis of carpal tunnel syndrome. Muscle Nerve. 2012 Aug;46(2):287-93. Fowler JR, Gaughan JP, et al. The sensitivity and specificity of ultrasound for the diagnosis of carpal tunnel syndrome: a meta-analysis. Clin Orthop Relat Res. 2011 Apr;469(4):1089-94. Hunderfund AN, Boon AJ, et al. Sonography in carpal tunnel syndrome. Muscle Nerve. 2011 Oct;44(4):485-491. Katz RT. Carpal tunnel syndrome: a practical review. Am Fam Physician. 1994;49:1371-1379, 1385-1386. Ly-Pen D, Andréu JL, et al. Comparison of surgical decompression and local steroid injection in the treatment of carpal tunnel syndrome: 2-year clinical results from a randomized trial. Rheumatology (Oxford). 2012 Aug;51(8):1447-54. NINDS carpal tunnel syndrome fact sheet. National Institute of Neurological Disorders and Stroke website. Available at: http://www.ninds.nih.gov/disorders/carpal%5Ftunnel/detail%5Fcarpal%5Ftunnel.htm. Updated January 2017. Accessed September 7, 2017. O'Connor D, Page MJ, et al. Ergonomic positioning or equipment for treating carpal tunnel syndrome. Cochrane Database Syst Rev. 2012 Jan 18;1. Page MJ, O'Connor D, et al. Exercise and mobilisation interventions for carpal tunnel syndrome. Cochrane Database Syst Rev. 2012 Jun 13;6. Rayan GM. Understanding and managing carpal tunnel syndrome. Journal of Musculoskeletal Medicine. 1999;654. Shores JT, Lee WP. An evidence-based approach to carpal tunnel syndrome. Plast Reconstr Surg. 2010 Dec;126(6):2196-2204. Steyers CM, Schelkun PH. Practical management of carpal tunnel syndrome. Phys Sportsmed. 1995:83. Whitley JM, McDonnell DE. Carpal tunnel syndrome. Postgraduate Medicine. 1995;97:89-92,95-96.